Don't miss out on the fun at Citizens Bank Park - here's a guide on the best ways to obtain Phillies tickets. This spectacular section, regrettably, does not go up for sale to the public. Now that you know the ticket prices, we'd recommend that you take a look at our Guide to Citizens Bank Park - which addresses many of the common questions about fully enjoying the experience, to which your Phillies tickets entitle you, at Citizens Bank Park. For example, it includes a long, in-depth review of Harry the K's Restaurant - which is located in the outfield, and which we highly recommend. 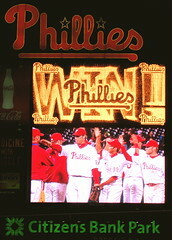 Now that you have your tickets, the next question is how to travel to Citizens Bank Park. We strongly recommend taking SEPTA, especially if there are other events going on in the South Philadelphia Sports Complex. We feel so strongly about this, in fact, that we've created a highly detailed SEPTA to Citizens Bank Park Guide - which analyzes the best way of reaching the ballpark, via the Broad Street Subway - as well as the SEPTA Blue Line - both of which require SEPTA Tokens, which is why we've created a Guide to SEPTA Tokens as well. In addition, we describe in detail how to use SEPTA Regional Rail to connect with the Broad Street Subway, at either City Hall Station - which we highly recommend, or at Fern Rock Transportation Center, which is something you should only try, if you're very familiar with SEPTA, and a native Philadelphian, as well. If you'd like to leave Phillies Tickets and return to the Home Page of Enjoying Philadelphia, please click here.